St. Elia the Prophet Orthodox Church in Akron, Ohio, decorated in preparation to celebrate the Nativity of Christ. Come, embrace the Nativity Gospel, and live it by being a part of God’s love and compassion and forgiveness! Seven days within the Season of Advent – on November 21st, the feast of Mary’s Entrance into the Temple as a child is celebrated. This feast is filled with important spiritual significance for the believer. The texts of the services tell how Mary was brought by her parents as a small child to the temple in order to be raised there, consecrated to the service of the Lord, until the time of her betrothal in marriage. 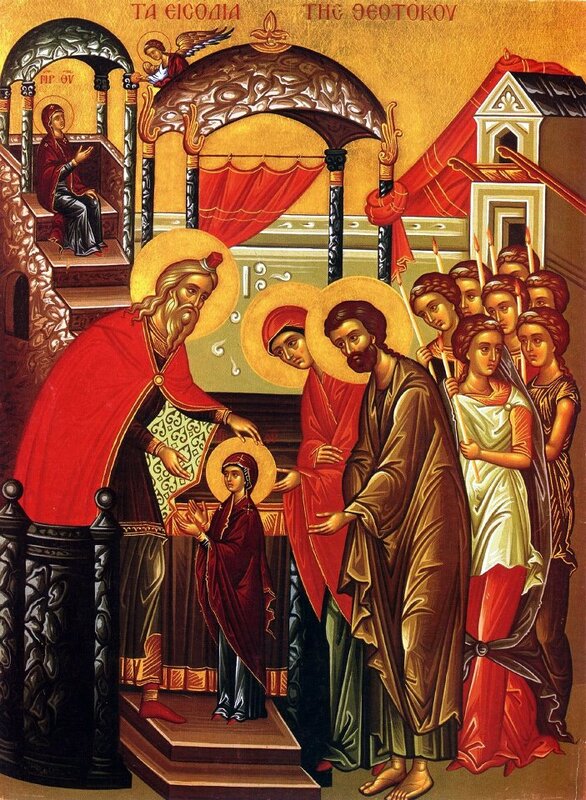 According to Church tradition, Mary was solemnly received by the temple community which was headed by the priest Zacharias, the father of John the Baptist. She was led to the holy place in order to prepare herself to become the “holy of holies” of God, the living sanctuary and temple of the Divine Child Who was to be born of her. The main theme of Mary’s entrance into the Temple is the fact that she enters the Temple to become herself the Living Temple of God, thus inaugurating the New Testament in which are fulfilled the prophecies of the Old Testament that “The Dwelling Place of God is With Man” and that the human person is the sole proper dwelling place of the Divine Presence. The Vesperal Divine Liturgy for this Feast will be celebrated on Tuesday evening, November 20, 2018, at 6:00 p.m.
On November 15th, forty days prior to the celebration of the Feast of our Lord’s Nativity, the Holy Orthodox Church begins the Christmas Fast. This period of six weeks is often called Advent, which means the Coming, and refers to the Coming of the Lord and Savior Jesus Christ in the Mystery of His Holy Nativity. Christmas and Epiphany are Feasts of Light, celebrating the Coming and Manifestation of Christ, the Light of the world. Nature itself helps us to experience these Feasts of Light. With the coming of the winter the days get shorter and the nights longer, but once we reach Christmas Day itself the reverse begins to happen. Nature prepares for the Coming of Christ, the Light in the darkness – and so do we during the Holy Season of Advent. To help in our preparation, we will have an Advent Wreath in Church. The Wreath made of evergreens will have six candles on it – on for each week in Advent. Each Sunday, beginning November 18th , along with special prayers, we will light a candle on the wreath – as we prepare ourselves to receive Christ the Light of the world into our hearts. For unto us a Child is born. :Unto us a Son is given. And of His peace there shall be no end. Join us for our Annual Parish Family St. Nicholas Celebration! Followed by a free-will offering (Lenten) luncheon and a visit from St. Nicholas! There is something for everyone of all ages on St. Nicholas Sunday at St. Elia…oh, come and see.